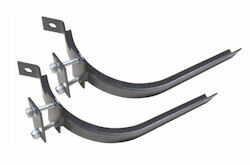 Standard padded Kayak J Bars that clamp around standard or aero roof bars for transporting a kayak on it's side. Especially good for transporting touring & sea kayaks as the hull shapes fit the cradled design well. Secure your kayak in place using a pair of roof rack straps using the holes at the top and bottom of the cradle. Foam padding for protection and to provide additional grip.